Beautifully located downstairs at the Hilton in Branson Landing, Big Whiskey’s American Restaurant & Bar is the best place to enjoy a relaxing dining in Branson after you’re finished shopping. Big Whiskey’s is such a nice dining spot to stop by for a great meal and cool refreshments and hang out with friends. Voted as one of the best restaurants and bars in Springfield and Branson, you’ll surely love the atmosphere both inside and on the patio. This beautiful restaurant and bar in Branson prides itself on offering a unique gathering place in a local community focusing on serving delicious food with great entertainment for all. Big Whiskey’s is following the restaurant’s tradition of maintaining the highest standards of quality and superior customer service and things that truly set them apart from the rest. Their high quality menu items range from appetizers, salads, and sandwiches to burgers, pastas, and hand-cut steaks with a full bar that features whiskey on tap. 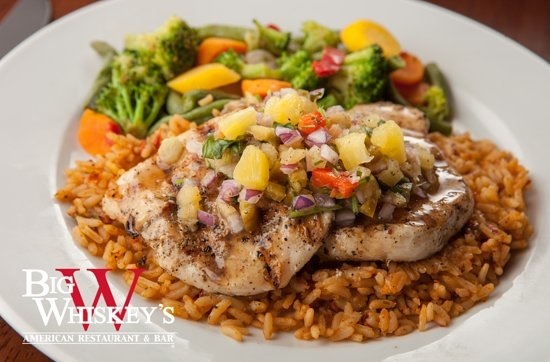 Dining in Branson, especially at Big Whiskey’s American Restaurant & Bar, you are sure to enjoy a warm and inviting atmosphere with excellent personal service. Dining in this restaurant will give you a unique culinary experience as you will enjoy extensive list of delicious entrees including 28 day aged Kansas City beef and full wine list. Big Whiskey’s is a restaurant that also offers hand-cut steaks, street tacos, craft burgers, award-winning wings, salads, 100+ whiskeys, and 25 different kinds of beers on tap. Big Whiskey’s is not just a sports bar, it offers a unique dining in Branson where you can enjoy excellent bar products. Whether you want to have lunch, dinner or late night happy hour, Big Whiskey’s is always ready to serve you the best of everything. This restaurant and bar offers a few of their specialty menus that include Buffalo Chicken Dip (shredded chicken, cream cheese and buffalo sauce blended together and served with warm tortilla chips and celery); Rick House Ribeye (12 oz. hand-cut ribeye, seasoned and grilled to perfection, topped with the restaurant’s signature steak butter and served with steamed broccoli and loaded mash potatoes); and Big Whiskey’s BBQ Burger (a big burger piled high with crisp bacon, golden onion rings and smothered with honey whiskey BBQ sauce). The patronage of whiskey has spread all over the world. Each whiskey reflects the diverse style of the country’s culture. Corn is used in the US to make whiskey and barley in Scotland, whiskey, at its simplest way of making, is a beverage distilled from a mash of grain. Brandy is distilled from a wine while whiskey is distilled from a beer. The types of grains and the quality and type of water used, the method of distillation, the length of maturation, the proof of distillation, and the type of wood used in aging all contribute to the quality and type of whiskey. When you are having a wonderful vacation in Branson and find yourself craving for a delicious meal with some whiskey, Big Whiskey’s at Branson Landing is the place to go.